A plot of residential land measuring 2.13-Acre at Lucknow has been purchased and registered in favour of IRWO on 19-11-2013. Building plans have been approved by Lucknow Industrial Development Authority (LIDA). Permission for Environment clearance and Pollution Control for STP has been obtained. Tender for the work has been finalized already. Total 22 allottees are available. The scheme has been reopened for booking as vacancies exist. RERA registration number is: UPRERAPRJ8170. 1.It is about 16 KM from Charbagh Railway Station on lucknow kanpur national highway. 2. 6 Km from Air-port. 3. 13 KM from Alam Bagh Bus stand. 4.There are Number of reputied educational Institution like Awadh Collegate & CIPET College which is about 10 KM from site. IRWO has purchased 12.86-Acre of land at Kota and project is planned in two phases. These are single-storied plotted row houses. In Phase-I, 62 DUs were planned. The contract was awarded in April, 2015 but had to be terminated on 07-09-2016 due to tardy progress of work. Fresh contract has been awarded. Contractor is working on the new block of DUs and community center. External works, and construction of the boundary wall are nearly completed. Allotment of specific DU has been done on 09- 10-2014. One DU has been handed over. RERA registration number is: RAJ/P/2017/496. The scheme has been re-opened to blood relations of IRWO members, employees of Nationalized Banks, employees of other Government establishments and all Indian nationals for booking to fill up the vacancies. 18 plots have also been put on sale on “first come, first serve” basis for IRWO members and others. 2 plots have been booked. 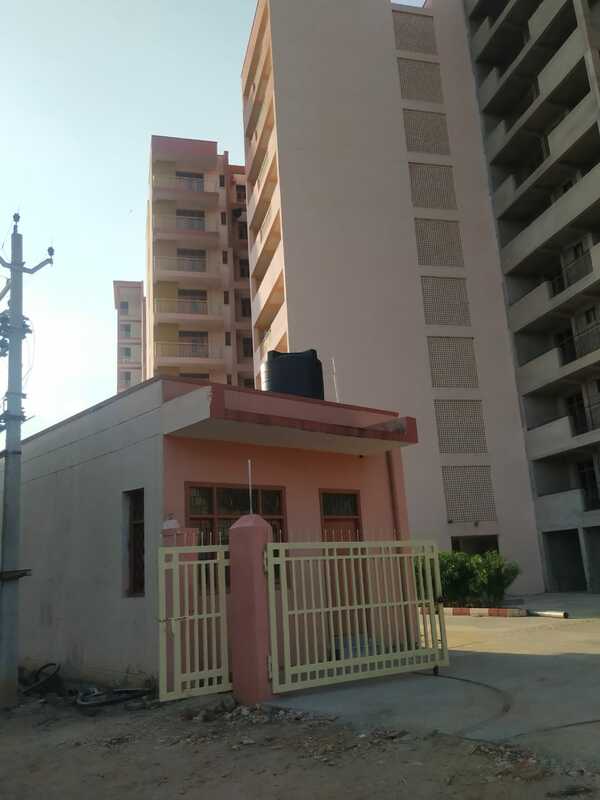 A plot of land measuring 3.24-Acre in Sector 37 of Jagatpura in Jaipur, approved by Jaipur Development Authority (JDA) for “residential use” has been purchased and registered in favour of IRWO on 03-12-2013. Building plans have been sanctioned by JDA. 261 multi-storied dwelling units are to be constructed. Tender was opened on 05-08-2015 and work awarded on 27-11-2015. Structural works and brickwork of all the six buildings, community centre and construction of boundary wall have been completed. Finishing of 81 units in blocks A & D and external works are in progress. 48 booking letters have been issued. The scheme has been re-opened for blood relations of IRWO members, employees of Nationalized Banks, employees of the other Government establishments and all Indian nationals. RERA registration number is: RAJ/P/2017/467. 11.88 Acre of land was procured in the year 2004 and the housing scheme has been planned in two phases. In Phase-IIA, 140 dwelling units have been planned. Contracts were earlier awarded on two occasions but due to various reasons and court cases, the contractors could not complete the work and contracts had to be terminated. Fresh tender has been awarded in first week of June, 2015 and the work has been completed. Electric power connection has been obtained. Connections for water supply and sewerage have also been done. Draw for specific allotment of DUs was held on 02-06-2018 at Chennai. Results have been uploaded on IRWO website. Handing over of units is in progress. In Phase-IIB, 161 dwelling units have been planned. Building plans were submitted to Chennai Metropolitan Development Authority (CMDA) in the month of May, 2015. A number of meetings and discussions were held with CMDA authorities for early approval of plans. In this regard, Member Staff had also written a letter to Chief Secretary, Tamil Nadu Government for early approval of the plans. Building plans for 161 DU’s have been sanctioned by CMDA and Municipal Authorities. Tender for the work has been finalized. For the 9 blocks, work is in progress at foundation / plinth level. RERA registration number is: TN/02/BUILDING/0195/2017. .
A turnkey tender including transfer of land, for construction of single-storey houses was opened on 17-03-2016. LOI issued on 28-06-2016 was accepted by the Contractor and turnkey agreement executed on 30-08-2016. Transfer, registration and mutation of about 1.9 Ha of land has been done in favour of IRWO. Issue of chak road has been got finalized from the revenue authorities at Lucknow. Building plans and structural drawings have been submitted to Moradabad Development Authority (MDA) for approval. The housing scheme is open for booking of dwelling units. 9 DUs have already been booked and 4 applications have been received. Booking to the applicants shall be made after sanction of plans by MDA. RERA registration number is UPRERAPRJ8575. Sonepat is one of the largest group housing projects constructed by IRWO. There are 660 dwelling units and 117 EWS units. Buildings have been designed for earthquake resistant forces and firefighting installations have been provided as per the Haryana Government norms. Colony is provided with Solar Water Heaters, rain water harvesting and sewerage treatment with provision of recycling of waste water etc. The colony has been given Gold Grading by State Environment Appraisal Committee (SEAC) for satisfying laid down parameters of water conservation, energy conservation and noise level control etc. So far 626 possession letters have been issued and 617 allottees have taken possession. 22 EWS units have been handed over out of 24 possession letters issued. There are about 18 dwelling units vacant. Scheme has been reopened for booking for all Indian nationals. Occupancy certificate has been issued by DGT & CP. In Zirakpur, total 399 dwelling units and 44 EWS units are planned in two phases. All the 195 units in Phase-I and 204 units in Phase-II have been completed. Draw for allotment of specific unit for Phase-I and Phase-II was held on 30-05-2015 and 17-10- 2015 respectively. 390 allottees have taken possession. RERA registration number is: PBRERA-SAS79-PR0043. 6 DUs are vacant. Scheme has been opened for all Indian nationals.